To begin with, Pre-heat your oven to 300 F.
We'll be using the yolks of 8 extra large eggs. To separate an egg, crack the egg and pull the shell apart into two equal-sized halves. 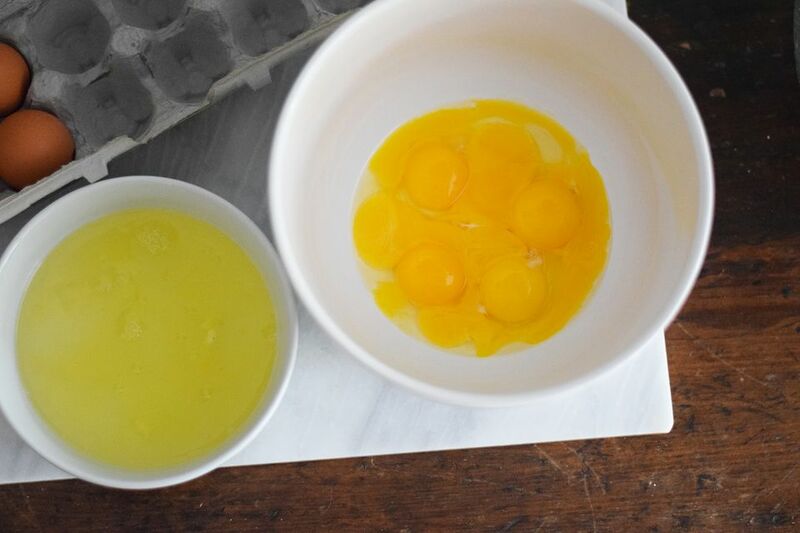 Then, with a clean bowl underneath, simply shift the yolk back and forth from one half of the shell to the other, letting the whites fall into the bowl below. Collect the yolks in a large mixing bowl. Save the egg whites to make a high-protein, low-fat omelet, a meringue or, for the stout of heart, a soufflé. Using a whisk, beat the yolks for a minute or two, or until they're completely smooth. Now add 1/3 cup sugar and continue to whisk for about 2 more minutes, or until the sugar is fully incorporated and the yolks are a pale shade of yellow. For this recipe, we need 2 cups of cream. We like to use 1 cup of heavy cream and 1 cup of half and half. For a richer crème brûlée, use 2 cups heavy cream, or to make it a bit lighter, use 2 cups of half and half. Add the cream and whisk until fully blended. Add 1 teaspoon of pure vanilla extract and whisk until blended. Straining the custard filters out any eggy bits to ensure a nice, smooth consistency. Carefully pour the custard through a wire strainer (known as a sieve). Here's a tip: rinse any egg particles out of the sieve with cold water before washing it. Hot water will cook the egg particles into the wire mesh, making it really difficult to clean. Fill a large roasting pan with an inch or two of warm water, and place your empty ramekins into the pan. This water bath is called a bain-marie. The water should come about halfway up the ramekins. 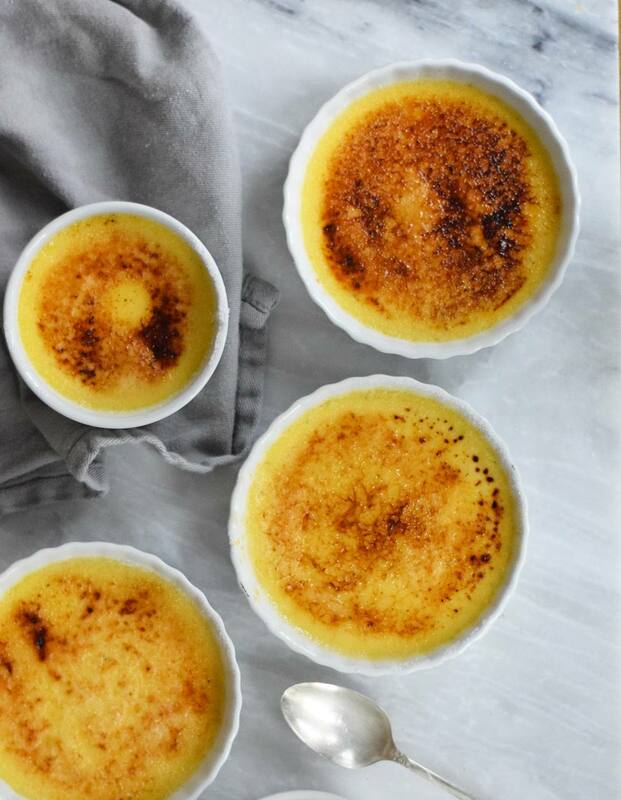 Baking the custards in a bain-marie keeps the air in the oven moist, and prevents the crème brûlées from cracking. Carefully pour the custard into the ramekins. Fill all the ramekins about halfway, then top up each one a little at a time. That way, you won't run out of custard before they're all full. Now transfer the roasting pan ​to the oven. You're going to have to hold it steady so that you don't slosh water into the ramekins. Bake for 35 minutes or until the edges are set but the centers just barely jiggle when you nudge the pan. Remove the pan from the oven and allow the custards to cool in the water bath for 30 minutes or so. Then remove the ramekins, place them on a flat sheet pan or tray, cover with plastic and chill for at least 4 hours, up to overnight.